The Wonderlic Cognitive Ability Test is an intelligence test used by employers to assess the ability of a candidate to learn and problem solve in a stressful situation. Performance on the Wonderlic is often an important factor in a candidate’s application for employment. 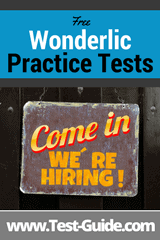 Use these Wonderlic practice tests to insure you score well on your exam and get that job! Full Wonderlic Practice Test (Timed) - Full 50 question test with 12 minute timer. Be sure you are using an appropriate Wonderlic practice test which gives a variety of question formats. The Wonderlic consists of four sections which can be used to predict an applicant’s aptitude to perform the function in the position for which they have applied. Any or all of them can be given by an employer, based on the abilities needed for the position being filled. The Wonderlic Skills Tests provide a quick measure of basic quantitative and verbal skills that are designed to show an applicant’s readiness to perform an entry-level job function. The intention is to reduce training time as well as turnover by identifying candidates who are able to handle the function of the job they are applying for. Any position that requires basic mathematical calculations or written and oral communication by the employee would make use of the Wonderlic skill tests. Wonderlic Cognitive Ability Tests are most often used among employers who use the Wonderlic tests. Many of the Wonderlic practice tests found online are versions of the Wonderlic Cognitive Ability Test. Employers in a wide range of industries use this test for pre-employment recruiting and selection, assessing applicants’ skills in learning, adapting, problem solving, and following directions. Wonderlic Cognitive Ability Pretest- an unproctored test which gives a general idea of the applicant’s abilities. Is shorter, lasting only 8 minutes. The Wonderlic Behavioral Liability Test is designed to measure an applicant’s potential for engaging in behaviors which can be seen as unethical or otherwise a liability. The intention is to identify candidates who are least-likely to be high-risk employees. This test is often used when assessing candidates who have little or no prior experience in the workforce, or if they will be provided with access to company assets such as equipment, cash, vehicles, or merchandise with little or no direct supervision. The Wonderlic Personality Test is designed to measure a candidate’s personality characteristics in order to predict whether he or she is suitable for the position in question. It provides employers with a look at popular personality factors which appear in the candidate, in order to predict job performance in the job function. It also allows employers to match candidates with the jobs they are most suited for, by determining whether a candidate’s individual makeup of personality traits fit appropriately with the specific job function for which they are applying, or perhaps a different one. The Wonderlic Cognitive Ability Test is administered in 12 languages around the world. For most Wonderlic tests, applicants are given 12 minutes in which they are asked to answer 50 multiple-choice questions. The questions continue to increase in difficulty as the applicant moves on through the test. Candidates are not expected to finish the test, however they are encouraged to complete as much of it as they can. Depending on which version of the Wonderlic is being given, administration of the test can either occur on-site by a Wonderlic-trained human resources staff, or with a Wonderlic Independent Test Administrator at an approved location. Those who are taking the Wonderlic Cognitive Ability Test are usually doing so as part of the application process for employment or for acceptance into a particular college. Usually, the applicant is registered for the test by the employer or recruiter who ordered it. Registration and administration of the test will vary, as testing can occur anytime throughout the year as-needed. Since there is no particular “testing date” to look forward to, it is important that applicants begin using Wonderlic practice tests immediately. Unlike many other standardized tests, the Wonderlic is usually not paid for by the person taking the test. Employers, recruiters, and others who need to test their applicants are the ones who pay for the test, although sometimes they do pass part or all of that cost down to the applicant. Wonderlic does not publish their prices online, and instead states that anyone interested should contact their sales department for details. The Wonderlic is available for any applicant of a college, entry-level position, or any other position as deemed necessary by the recruiter or employer. Requirements regarding who does and does not need to take the test, at which point in the application process it occurs, and which test to take are all up to the hiring company or enterprise. As described above, the Wonderlic test usually consists 50 multiple-choice questions which increase in difficulty as the applicant gets farther into the test. Test takers are given 12 minutes to complete the test, giving them an average of just under 15 seconds to complete each test. Scoring is fairly straightforward; the score earned is calculated as the total number of correct responses produced in the time allotted. A score of 20 indicates “average” intelligence, as compared to an intelligence quotient (IQ) of 100. Wonderlic, Inc. considers a score of 10 to indicate that the applicant is “literate”. *Please note that Wonderlic test results are the property of the institution or company that issued the test. Most applicants never see how they scored, unless permission is given by the institution or company. The Wonderlic can be an excellent tool for employers to evaluate potential employment candidates. It is important to make use of Wonderlic practice tests in order to prepare for your next job opportunity. Disclaimer: Not affiliated with or endorsed by Wonderlic, Inc. Wonderlic is a registered trademark of Wonderlic, Inc. and is used here solely for purposes of identification.